I'VE been to plenty of opening nights at QPAC where the show gets a standing ovation. But I've never seen a musical receive a spontaneous standing ovation in the first act. Disney's Aladdin the Musical inspired just such excitement at last night's Queensland premiere. The show's spectacular, marathon number Friend Like Me is such a wonder the cast has to wait for the applause to die down to move on with the show. It's the stand-out number Australia's new home-grown Genie Gareth Jacobs. Genie and his wish-granting powers grows into a tap-dancing climax complete with fireworks. The scale is only rivalled by two other moments in the show: the parade of Prince Ali and the magic carpet ride of A Whole New World. Ainsley Melham and Hiba Elchikhe are the heart of the show as young lovers Aladdin and Princess Jasmine, but it's the effervescent Genie whole steals the show. Adam Murphy and Aljin Abella also deserve special mention as Jafar and Iago; the baddies provide much of the comic relief and their evil laughs become something you look forward to. Aladdin is the biggest, brightest musical of the year - a giant singalong full of laughs and theatrical magic tricks. 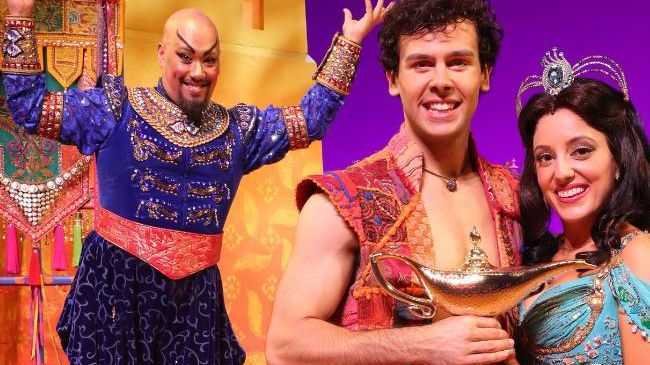 If you see one musical this year make sure it's Aladdin, your childhood self will thank you. Aladdin the Musical plays QPAC's Lyric Theatre through June 3.